Let's Talk Process with artist Ruth Welter! — Michael Mitchell Jr. Welcome to Let’s Talk Process, Issue No. 1! Thanks so much for joining me for the debut issue of my ongoing artist interview series! I’ve always been fascinated by the creative process, and my goal for this series is to dig deeper and explore how various creative people specifically approach their daily work. With that in mind, the questions for Let’s Talk Process center around the unique processes of artists & authors, how and when they work, routines, and inspirations. Without further ado, I’m excited to spotlight the creative process and beautiful art of acrylic artist Ruth Welter! Hi, Ruth! To start, tell us a little about yourself and your art. I started painting back in 2000 when I first became interested in art. At that time I took lessons from a wonderful artist/illustrator/teacher near my home in NY. I was also beginning to delve more and more into gardening and I became quite addicted to planting, arranging, and watching my garden take shape. Pretty soon, the subjects I was drawn too were almost all garden related. I've worked over the years to develop my own artistic style and hope to never stop growing, learning and evolving with my art. Today, I paint mostly in acrylics on watercolor paper. I find subjects in my garden and in other gardens I visit either near my home or when traveling. 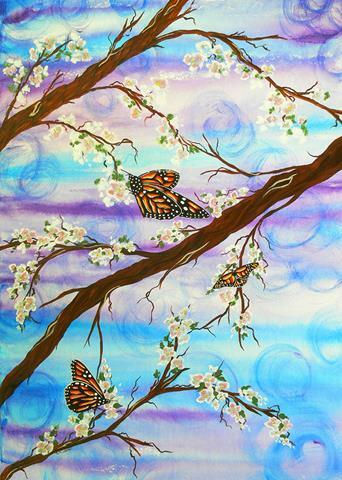 I love to use happy, vibrant colors in all my paintings of birds, flowers, butterflies and nature. I typically work on a painting whenever I have the chance during the day or evening. I don't really have a schedule, I just work when the mood strikes. That might be more days one week than the next but whatever is good for me time and inspiration-wise, I will do. Not really.... I've worked on things in the early morning and late into the night and the only thing that seems to matter is that I feel in the mood to work. I don't work when I'm not feeling inspired and try to force myself into creating, it usually ends in disaster and that is when I might ruin a painting. I guess I've learned over the years to only create when I'm feeling in the zone. How much planning goes into your creative process? Do you set self-imposed goals or deadlines along the way? For me self-imposed deadlines mean pressure and I generally find I don't do my best work under those circumstances. Once I finish a painting, I immediately start considering what my next subject will be. This might take days of going through ideas in my mind and then sitting down to work some things out on paper and sort out my ideas. If a subject doesn't feel right to me when I sit down to work with it, I know I have to change tracks and work on another idea. I always believe in letting the painting guide me, and I know when the seed of an idea starts taking shape, it gets sketched out and feels right. Most of the time, that will be a good painting for me. As you know Michael, I'm on Twitter and I love it!! It has helped my creative process in quite a few ways. First of all, I love seeing all the very talented artists out there and the beautiful work they are creating. I think seeing so many lovely pieces on a regular basis gets my own creative juices flowing. Most importantly though for me, the sense of friendship, respect, and kindness I have received from people I have never met in person, blows me away. These creative, inspiring people really keep me going and keep me motivated to create good art. Do you have any particular rituals, locations, and/or favorite tools that are necessary for your creative process? A mug of tea gets me going if I'm feeling a bit sluggish, and nothing gets me painting like the lure of a good book. I'm an avid audio book listener, and I'm constantly purchasing new books to read while I work. I will listen to my favorites over and over again. I find that if I'm having a hard time getting motivated to sit down and get busy painting, the quickest way I have to get moving in my studio is to get involved in my latest book. Years ago, during a particularly bad time for me as an artist, I discovered coloring. Coloring has became the greatest of therapies for me, I can spend hours, days, even weeks coloring. I find if I'm tired of working on a painting, frustrated with it or just want a little vacation from a piece of art, I get out a coloring book. I'll color until I feel better about the painting I'm working on or as kind of a palette cleanser, so to speak, between projects. Funny enough, I love to color busy scenes, the more hectic the better, which is very different from the work I create. When I've come to what I think is the end of a piece, the first thing I do is sign it. I really just walk away at that point, flip the pad over, cover up the piece etc... then come back the next day. I can usually always find little things to tweak, and that is the time I will do so. Then, I might start work on the next piece or grab my coloring books for awhile, but I will come back to the previous work until I can find nothing more to tweak. This process may take days but at that point, I know I'm done. If you enjoyed this interview, feel free to comment below and share the interview link on social media! Issue No. 2 will be published on Wednesday, April 17th. See you then! ← Let's Talk Process with illustrator Vanessa Knott!